Brigham City-based Skyline Dental specializes in perfecting smiles. 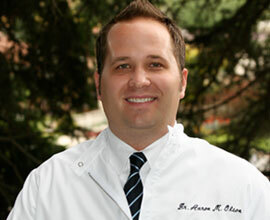 Dr. Olson studied advanced procedures in general dentistry with an emphasis on complex comprehensive treatment. I am 11 years old and used to be afraid of going to the dentist until I met Dr. Olson. He is really funny and nice, and has a great toy selection! I like the way his office looks. He helps teach me how to take better care of my teeth and knows a lot about them. My children now look forward to going to the dentist! My family and I recently became patients at Skyline Dental. Dr. Olson and his staff are so friendly and accommodating, my children now look forward to going to the dentist! Dr. Olson's knowledge and skills are unparalleled. I never knew going to the dentist could be such a pleasant and easy experience. Thank you Skyline Dental!! I was very impressed with Dr. Olson’s knowledge and honesty. It's becoming very difficult to find a dentist or a doctor that values your time and money. The primary goal of many is to maximize returns from insurance companies and perform unnecessary and expensive procedures. I was pleasantly surprised not to find this at Skyline Dental. I was also very impressed with Dr. Olson's knowledge and honesty. I was very pleased to find that Dr. Olson was so accommodating to my demanding work schedule and was able to complete the procedures needed in as few visits as possible. He is a dentist that I will continue to go to as long as he is practicing and refer all of my friends and family to. © SKYLINE DENTAL, a top dental practice in BRIGHAM CITY, UTAH serving TREMONTON, BEAR RIVER CITY, WILLARD, and surrounding areas.